The Richfield Township offices are located at 3951 Washburn Rd., Berkey, Oh. 43504. 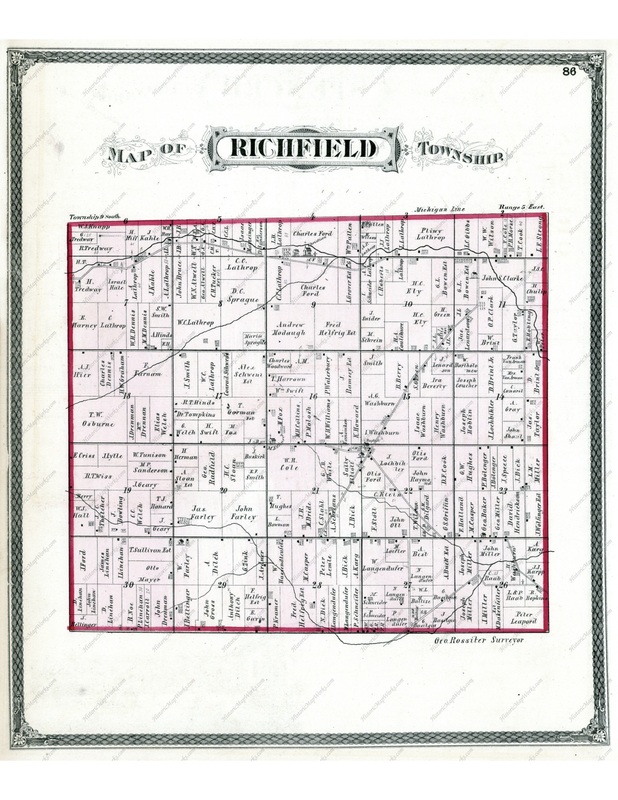 Although the first settlers, Pliny Lathrop, Jacob Wolfinger and David Hendrickson arrived in 1834, “Richfield Township” was not actually organized and named until 1839. The presiding pioneers choose the name “Richfield” because of the rich nature of the soil, some of the richest in Lucas County. Today, Richfield Township is a growing, rural, agricultural community situated in the extreme Northwest corner of Lucas County and encompasses 22.659 miles. The Township provides well maintained roads and the best fire, EMS to its residents. We are dedicated to maintaining our rural identity, preserving our heritage, and balancing our growth. 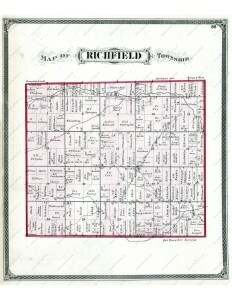 Richfield Township takes its name from the rich nature of its soil, some of the richest in Lucas County. Created in December 1839, the township was formed from parts of what were then Springfield, Wing (Swanton), and Sylvania townships and included a portion of todays Spencer Township until 1845. Pioneer farmers, whose parents fled religious persecution in Germany during the 1740s, first settled in Richfield Township in 1834. These farmers were Jacob Wolfinger, David Henderson (Hendrickson), and Pliny Lathrop. Over the next four years several other families joined them including James Farley, Issac Washburn, Joseph Smith, Lucien and Araunah Lathrop, and William R. Cole. Many of their descendants still live and farm in the community today. Jacob Wolfinger built the first log house in what is now known as Secor Metropark. Wolfinger and Lathrop did the first clearing consisting of fifteen acres put into wheat, and Wolfinger planted the first apple and peach orchard three years later. Two of the Wolfinger children were the first white persons to be born and to perish in the township. The burial on the Wolfinger farm marks the beginning of todays Wolfinger Cemetery. Jacob Wolfinger was also elected as one of the first township trustees in April 1840. In 1837, Pliny Lathrop and his brother Lucien settled in the northern part of the township and built the first frame house and frame barn there. A log schoolhouse was also built near the settlement (Sec. 9) at this time. Lucien Lathrop was the first postmaster at Riga (the Riga name changed to Berkey in 1865) and was succeeded by Pliny fifteen years later. Pliny also served as township clerk, trustee and justice of the peace, and was one of the organizers of the Richfield Christian Church in 1855. Araunah Lathrop was one of the first constables and supervisors of roads, and later served as trustee. David Hendrickson settled in the central part of the township. He was elected constable and fence viewer at the first township election, and subsequently served as trustee. Issac Washburn also established a farm in the center of the township (80 acres in Sec. 15), and served several terms as trustee and treasurer. James Farley settled on 160 acres of land and was one of the organizers of Farleys Class, the townships first religious organization in 1848 todays Farley United Methodist Church. 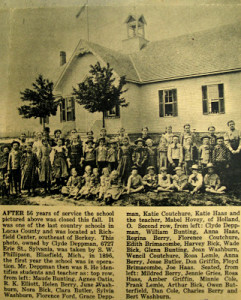 Services were held in the log schoolhouse until moving to a building known as the Washburn School near the site of todays Richfield Township Hall. The present church at Sylvania Avenue and Berkey Southern Road was dedicated in 1870, and descendants of the original founders are still members of the church and continue to serve as community leaders today. In 2017 the Farley Methodist Church was tore down. The settlement near Berkey grew during the 1840s as the community’s first doctor (Dr. Mather M. Mason), merchant (A.D. Sanderson), and blacksmith shops (Jacob B. Gillan & Charles C. Welch) arrived. In 1865, Dr. Andrew Murbach arrived from Spencer Township and settled 1⁄2 mile south of what is now Berkey’s Four Corners. Later, during the 1870s, the Richfield Center settlement grew with the establishment of its first store (Henry King), a post office (William H. Williams, postmaster), a blacksmith, harness and shoe shop, wagon repair and grocer (George Darton, Mr. Hoover, and John Haas), as well as another doctor (Dr. E. Tompkins). By the 1900 census, Richfield Township had a total population of 1,136 people, with 100 in Berkey and 111 in Richfield Center. In 1915 Berkey incorporated as a village, the Richfield Center area did not. By the 1920 census, the Village of Berkey population had doubled to 201 people. This may be attributed to the fact that the Toledo & Western Electric line, part of the interurban line centering on Toledo, ran through the northern portion of the community. It connected Toledo and Pioneer (in Williams County), via Sylvania and Berkey, with a branch from Allen Junction to Adrian, Michigan.